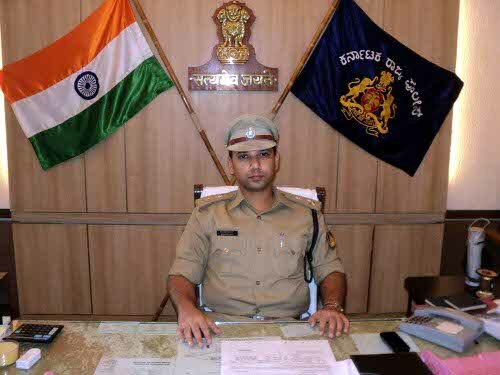 Superintendent of Police of Belgaum Sandeep Patil has won the Chief ministers Gold medal for his service. The medal will be presented on April 2 on the occasion of Police Flag Day. Sandeep Patil was this year elected as the person of the year 2011 by the readers of this site. Very encouraging news for general public to see positive news of a cop. It is a need of time and ignites a hope for the people to have such a honest and courageous police officer. Don’t remember any other police officer so popular amongst Belgaumites in a long long time. Sir, thanks for the work you have done so far and wish you all the best and luck for the future. Congratulations Sir! Great job! Great commitment! People of Belgaum always will be with you! Congrats Mr Singham (Sandep Patil)…keep going Sir ,please keep your crusade going curbing curruption and good governance, Here in Dubai Police is taught to be fridely and people frankly approach for their help maintiaining the law and order intact,, You are on same path. Sir happy to know that you have won the chief ministers Gold medal award for your service. Yes in my opinion you have done a good job for the city of Belgaum. I have also heard that you have not buckled to the pressures of MLA’s and etc. for which you were transferred and later it was canceled when people came on streets for you and stopped your transfer. All salutes to you Sir and now many many congratulations to you for your Gold Medal. But sir please let loose on wearing a Helmet. Hope you would please consider and do so. Thank you …… and CONGRATES again.